Cubes and Coroplast cages are used by pet owners and guinea pig enthusiasts around the world and have been for over a decade! Everyone highly recommends the C&C Cage solution. The features of these cages makes a GREAT experience for the guinea pigs and their caretakers alike. There are so many wonderful benefits. These are the standards, showing the absolute minimum cage sizes required as well the preferred cage sizes recommended. 2x3 grids 27" x 41" 10.5 ft² 2x4 grids 27" x 56"
7.5 ft² 2x3 grids 27" x 41" 10.5 ft² 2x4 grids 27" x 56"
10.5 ft² 2x4 grids 27" x 56" 13 ft² 2x5 grids 27" x 71"
13 ft² 2x5 grids 27" x 71" 16 ft² 2x6 grids 27" x 84"
not just one. They are happier and healthier in pairs or more. Note: A Grid is LARGER than a foot! 2x3 grids is LARGER than 2x3 feet! We use the 'safe grids' -- the inner holes are 1.5 inches. 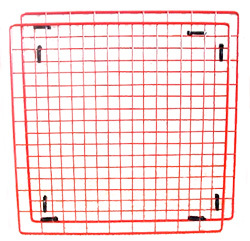 Grids with inner holes greater than 1.5 inches are too dangerous. But, even with the SAFE grids, you MUST BABY-PROOF your cage if you have young or small guinea pigs. Guinea pigs grow very quickly and are usually fine with grid walls at a few months old. But, you have to use your good judgement and common sense. Some guinea pigs are small in size and some have very narrow-shaped heads. In those cases, you may need to make adjustments for about 6 months to be safe. Baby-proofing is a temporary requirement. You can do a few different things. You can make the coroplast walls higher with some scrap pieces of Coroplast or even cardboard. Nine inch walls will be fine for babies. You can remove the temporary walls when the guinea pigs are large enough. OR, you can use cable ties and some extra grids, you can double up the grids in an overlay pattern, reducing the inner holes by half. Use Grids doubled up on the outside to reduce the size of the holes. All can be removed and reused when the guinea pigs are big enough.